In Nicaragua, Iveth Juárez, a small business owner who processes and sells cereal to the local market, had attended seminars, workshops, courses and training sessions on accounting and finance. But at the end of each session, she always felt the same sense of confusion. “But last year I participated in the TechnoServe workshop Keys to Financial Success and learned how and why finance functions. What’s innovative is how practical it is. It’s simple, direct, beautiful and not boring.” Juárez adds that it was also very useful, because upon returning to her business and examining her finances, she discovered that she was losing money on a product line. Juárez is one of more than 400 entrepreneurs in Latin America and Africa who have benefited from a new methodology for teaching accounting and basic financial topics. This methodology, which was developed and tested internationally by TechnoServe in 2011, is designed to be easy for entrepreneurs to understand and apply. Keys to Financial Success was created so that entrepreneurs could learn—visually and easily—how and why accounting functions and above all, so they can use it to manage financial statements for their own businesses, explains Holly Marvin, senior manager of capacity building at TechnoServe. The objective, Marvin says, is for entrepreneurs to realize that finance and accounting is not scary or boring, but rather a useful business tool that is worth their time and energy. “When entrepreneurs experience accounting with our method they stop being scared, have fun and learn easily. 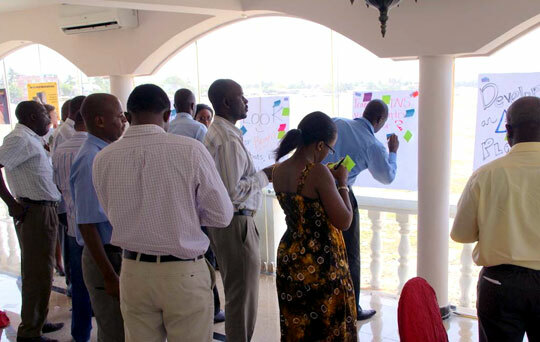 Some activities help them to reflect on how they can apply what they learned and use this new knowledge to make better business decisions,” says Marvin. One of the first things Keys to Financial Success does is demystify theoretical concepts; it uses basic references and metaphors that help entrepreneurs better understand the subject. “We do an activity to help people see that accounting is as simple and natural as organizing their clothes, but it’s just organizing financial information. We use a lot of simulations and visuals so the entrepreneurs can see and feel. It facilitates the learning process,” says Marvin. First, accounting concepts are introduced with pictures, colors and simple words. Then large plastic buckets and colored squares on the floor are used to teach the principle of double entry accounting and demonstrate the relationships between financial statements. The entrepreneurs end their training by analyzing financial reports and developing a strategy for increasing the profits of their business. So when Juárez returned to her business and applied her new financial skills she discovered that she was losing money with the price that she was offering for 454-gram bags of Soya Cereal. As a result, without disrupting her delivery process, she informed the supermarket chains and other buyers that she would reduce the weight of this product to 400 grams to stop her losses. According to some polled entrepreneurs, after TechnoServe’s training they started to organize their finances better and make strategic decisions to grow their businesses, a task that many of them previously thought to be impossible. Thus far, the training has been provided to entrepreneurs across Latin American countries like Mexico, Nicaragua, Guatemala, Venezuela and Chile, and also in Uganda, Kenya, Rwanda, Tanzania, Ghana and Benin.